This is a very nice park. Sites have lots of room with big shade trees. Very quiet and well maintained. Friendly staff. I would recommend this park and stay again. Front desk and propane guy were excellent. Park had a god truck Saturday night for all guests. Great food! The park was really nice with shade and grass. The only problem was we were so far from the bathrooms, we chose to not use them. It would have been better if there was another bathroom closer to the back area. The staff was nice and the site was easy to pull thru and level. We would stay here again but request a site closer to the office. We stayed here one night on our way through the Salt Lake area. The staff was friendly, the campground was clean. Gravel roads but not dusty, some grass between sights. 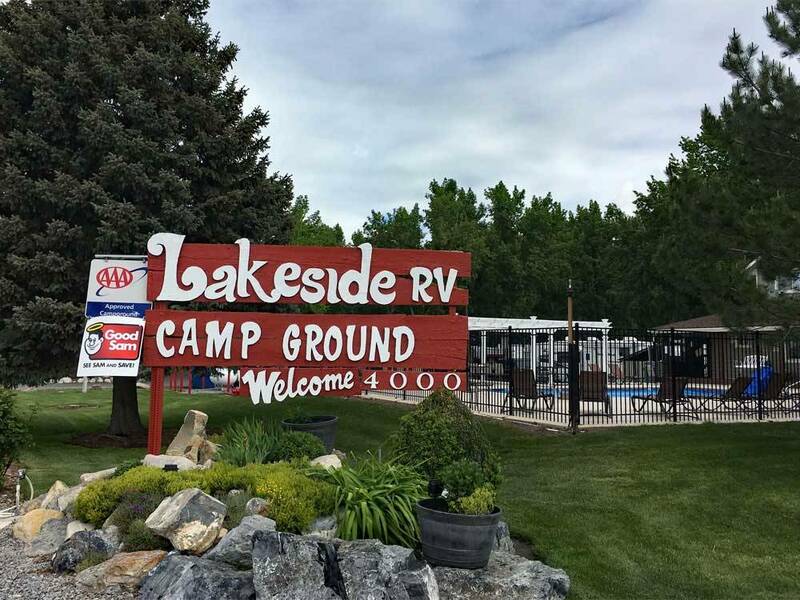 This campground is not lakeside, so don't be mislead by the name. You are very close to the State Park entrance which is on the lake. We did go explore the RV camping area in the state park and it was loaded with mosquitos! Would not recommend staying there! We would stay here again. We stayed here for 3 nights in our travel trailer while on our way to Alaska. It was great! We had a nice pull thru site with picnic table. The wifi was good as was the cable tv.. Wonderful fenced dog area (bigger than a usual run) for our dog to exercise and it even has a place for giving your dog a bath. Staff in the office were helpful and friendly. Laundry facilities were very nice and I used them. Pool not open yet. This park is right next to the Provo river and there is a path accessible to it. There are lots of shady spaces and many trees here. Also just down the road 3 minutes and walking distance is the Utah State Lake State Park....fabulous.The road basically dead ends into the state park. Across the street and over a couple of miles is the small Provo Airport. Allegient Airlines flies in there once or twice a day with smaller commuter jets, which might bother some people but we rather enjoyed watching them approach the runway and then take off up towards the snowy capped mountains. Mainly though it was just small private planes. It was not that loud to us. We did not see any dirty, old permanent rv's there as one review mentioned. We did meet one permanent resident who lives in a very nice late model motorhome. 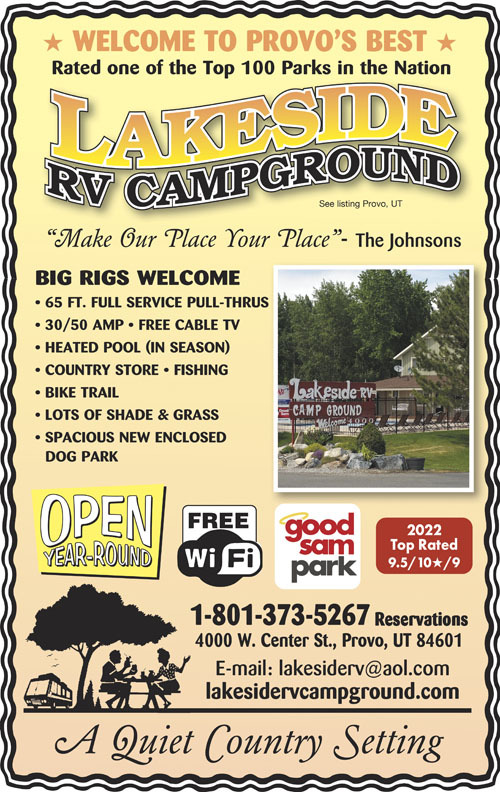 We highly recommend this RV park, and we certainly will go back there again for a longer visit. It was very, very clean and well maintained. We stayed here over theThanksgiving Holiday for 7 nights. The park owners and campers are very friendly. There are some full time people here and they are very accommodating. We had some problems with our tow vehicle and had to extend our stay two nights. One of the full timers noticed that and stopped by to see if we needed a ride anywhere. I look forward to coming back sometime in the summer. I would defiantly stay here again. Nice park. Clean restrooms and showers but a bit cramped. Many "resident" campers but not a problem. Nice walking trail around the park. I was skeptical when I read some reviews but I was glad I stayed here. There park attendant was nice and helped us find a spot that had satellite access. (some sites do not because of the trees). The sites are gravel and level and have picnic tables in the grass in front of the RV. There are some that are full timers in trailers there but the RV visitor section towards the back area is the place to be. There is a nice dog run for the pets and a riverwalk that is a nice distraction for the pets. We would definitely stay here again. Good Sam has rated this facility highly. Maybe it was 20 years ago, The grounds are dirty and unkempt. At least one third of the spaces are taken by probably section 8 low income housing. Much junk and other possessions around these trailers. I stayed there because of the rating but was sadly disappointed. Don't go there. I am disappointed with the rating that Good Sam gave this park! While walking past some of the extended stay sites it had a trailer park feel with the overuse of lawn decorations and blaring music. The bathrooms are quite clean, but there is a 2 hour closure for cleaning every day from 11a-1p (check out is at 11a). Most of the sites have nice shade, but are very close together, They are long enough that you aren't (passenger's side) door-to-door with your neighbor, but allow just enough room to walk through between the driver's sides. We felt compelled to keep our curtains closed since the neighbor's windows lined up with ours and they were only about 5 feet away. Our site had a sewage dump but is built up with cement which caused our hose (and slinky stabilizer) to be lower than the intake. Fortunately we had fully dumped the previous day so my husband chose to only dump the Gray tank. The small stream behind the RV Park was swampy and has no access to the walking path on the other side. The nearest access to the pathway is about .5 miles in either direction when leaving the park. The volleyball area is unusably small, but the play ground is a nice size. The pool is located right next to the main road and offers little to no privacy. There is also a busy airport directly across the street, but I believe it was closed overnight as we didn't hear any air traffic. The office staff were polite with me, but were curt and unfriendly with my 16 and 17-year old kids.